Donkey Kong is on top of a construction site throwing barrels. Mario has to dodge the barrels and climb his way to the top, flip the crane switch then use the crane to cut a wire on DK's girder. When all four girder wires have been cut, Donkey Kong falls. You score 1 point for each barrel you jump over on the lower screen and 2 points on the top screen. You score between 5 and 20 points for cutting a girder wire based on how long it took to reach. When all four girder wires have been cut, you score 20 points. If you spend too much time reaching the crane, the barrels speed up until they are too fast to jump over. 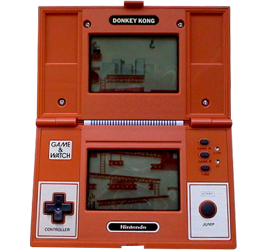 Donkey Kong was the first videogame to use the + shaped control pad, which was later used on the Family Computer and Nintendo Entertainment System. It has since gone on to become the standard digital input for video games.